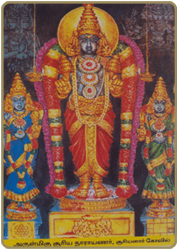 Suryanaar Koyil is located in the hamlet of Tirumangalakkudi near Kumbakonam and Mayiladuthurai near Thanjavur in Tamilnadu. This is a one of a kind temple dedicated to the Sun God and it also houses shrines to each of the other eight celestial bodies - the Nava Grahams. 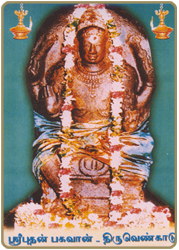 Very close by, are the Shivastalams Tirumangalakkudi and Kanjanur (Sukrastalam). 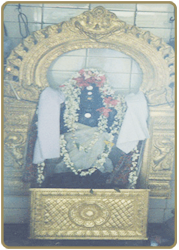 It is believed that if one visits this place and worships the Lord here, they will be rid of diseases and also it is believed that no one has died of snakebite in this place. 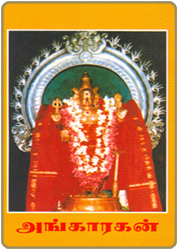 Vaitheeswaran Temple It is hailed as one of the 9 Navagraha Stalams, sacred to Mars - Angarakan it is visited by thousands. It is located in close proximity to Sirkazhi and Chidambaram. The temple tank, known as the Sidhdha-amrita-theertham, whose water is considered divine and is believed to cure many incurable diseases. Suvedaranyar Temle - Thiruvenkadu is located near Mayiladuthurai and is 10 km from Vaitheeswaran Koil and Seerkazhi railway stations. Pilgrims can alight at any of these stations to reach the temple. Wednesdays are very auspicious to Budan Bagavan, offering pooja to Budan Bagavan on Wednesdays is believed to rectify Budan Dhosham.